Ane Hjort Guttu makes troubling, philosophically profound works (pictured above) that question what it means for an individual to be at odds with the social structures they inhabit. There is an authenticity in her documentary-style works that touch emotive existential questions about personal autonomy, social disparity and individual versus collective freedoms. In Freedom Requires Free People (2011) an eight-year-old boy questions, disputes and disrupts the boundaries set, but not always explained, by the adult world. Time Passes (2015) is the destabilising narrative of an art student’s struggle to reconcile the moral imperatives encountered in daily life within the art-making act itself. This group exhibition from the collection of Frac Bretagne dedicated the Galerie Nord to the work of French husband and wife duo Anne and Patrick Poirier, providing an opportunity to experience one of the atmospheric low-lit sculptural landscapes from their 1975-79 Domus Aurea series. The sinisterly glistening waterlogged installation of a charred ruined city made from coal, wood and charcoal was inspired by psychoanalytic ideas around archetypes, the city and memory and drew on extensive time spent exploring Rome’s archaeological excavations and architecture. This beautifully displayed exhibition moved from playful to profound. Pakistani artist Rashid Rana’s seductive large-scale pixellated works, each densely composed of hundreds of digital images and large-scale projections, led the viewer to playfully engage with the space and with exhibition viewers in a parallel show in Lahore. The vivid spontaneity of Rana’s exhibition makes the quieter encounter with Indian artist Shilpa Gupta’s enquiry into the implications and meanings of border fences, security and dispersal all the more hard-hitting. A powerfully curated exhibition of borders and timeframes that had two distinct tempos. In the event that pocket money rates also take a hit from austerity cuts, Darren Cullen’s pop-up store and online service comes to the rescue, offering a range of loans for children. Posters on display offer the chance to ‘apply for a bouncy castle mortgage today!’ or the irresistible ‘rent-to-own gobstoppers! Buy now pay forever’; propping up the counter are a range of booklets and toys to aid with repayment. Beautifully executed, Cullen’s inventively sharp use of language and succinctly honed graphic style made this gift shop of disquieting treats for ‘the kid who wants more’ a highlight at Banksy’s Dismaland. As part of its Art Data Money programme, this group show conveyed with ingenuity, depth and humour the nature of money and value in the age of encrypted digital currencies and big data. Jennifer Lyn MonroeTM Ltd’s beautifully slick presentation and company mission statements took the cashing in of personal online data to a new and darker level as the somewhat machine-like artist incorporated her entire self, promising the potential to take control of her own assets and commodity value. Curated by Kyla McDonald and Laura McLean-Ferris, through the work of six artists this small but smart show – which started life at S1 Artspace, Sheffield – explored digital technology’s effect on words and their meaning. Film, sculpture, writing, painting, audio – all were employed to investigate the mediation and mangling of language in the online world. 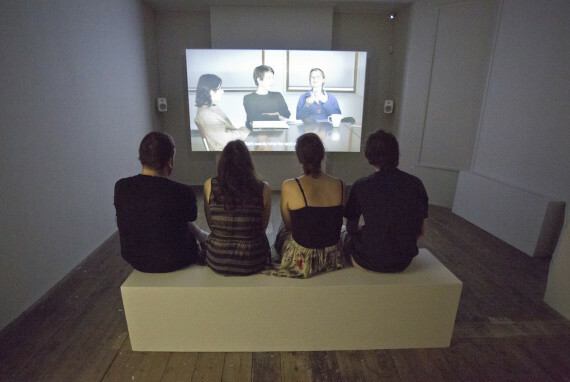 Highlights included Josh Kline’s Forever 48, a restaged remix of Whitney Houston’s infamous 2002 ‘crack is whack’ ABC interview, and Megan Rooney’s A Petit Maison – a sound piece and sculptural installation that invited us to lie down and soak up a confusingly enigmatic spoken-word narrative. Experimental documentary making and electronic music come together in Luke Fowler and Mark Fell’s surprisingly gripping 69-minute film about 1980s feminist photography collective Pavilion. While the interviews, historical material and cultural insights are in themselves fascinating, what makes this more than just a good documentary is the clever sonic and visual interplay, bringing an edginess and tension to a potentially dry trawl through the archives. Importantly, too, the problematic idea of two men assessing the impact of feminist photographers is not dodged. We all know about the tragedy of Iraq – the bloodshed, the chaos, the money and hope squandered. While this group show’s title, Invisible Beauty, suggested some respite from the bleak reality of this collapsed nation, anger and sadness was always close to hand. Curated by S.M.A.K artistic director Philippe Van Cauteren, work ranged from veteran Iraqi photographer Latif Al Ani’s images of a vibrant, 1950s Baghdad, to Akam Shex Hadi’s contemporary record of Isis-ravaged territory. Filling a 2003 invasion-sized hole was Cardiff-based Iraqi artist Rabab Ghazoul’s three-screen examination of Tony Blair’s Chilcot Inquiry performance – the curatorial glue that brought this exhibition’s disparate parts together. Subtly experimental and rooted in a deep appreciation of the visual and emotional world around us, the paintings and drawing of Agnes Martin (1912–2004) resonate with a kind of gentle power that borders on the spiritual. Or at least that was how it felt when I had the rare pleasure of viewing a Tate Modern show with just one other visitor in the gallery, first-thing on a quiet week-day morning. Tracking her development from New York abstraction to New Mexico seclusion, this wonderful show provided visual delight, historical context and a clear and compelling biographical narrative. A small but busy presentation of six films by the Lithuanian artist Deimantas Narkevicius, this short-run show was part of the 11th Berwick Film and Media Arts Festival – the first programmed by new director, Peter Taylor. With five films simply presented on small monitors with headphones, and the crisply cinematic Revisiting Solaris (2007) on a big screen, the works highlighted Narkevicius’ forensic eye, editing finesse and mischievous political mind. Born in 1964 and based in Vilnius, Narkevicius’ grapples with his country’s Communist past and finds absurdity and humanity in its troubled history. 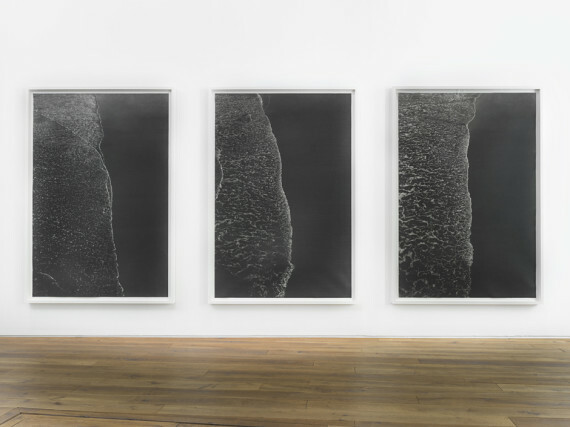 The carefully-arranged combination of Gerhard Richter’s enamelled works, Double Grey, with his Birkenau paintings based on photos taken of the ponds at Auschwitz in which human ashes were dumped, made reflection into a thought-provoking act. But adding an embedded choir (pictured above) to perform Arvo Pärt’s Drei Hirtenkinder aus Fatima from within the audience transformed the experience into something sublime and moving. It took SICK! Festival six years to get performer-choreographer La Ribot, but witnessing Laughing Hole in the Whitworth’s Grand Hall made it worth the wait. A group of female performers spent four hours attaching cardboard placards to the walls, laughing continuously at the desperate political messages written on them. By the end they were exhausted, and the laughter disturbing. Unforgettable. Co-curated by Clarissa Corfe and artist Harold Offeh, this unusual group show took the career of early 20th century Preston comedian Will Onda as its starting point. A standout performance day included Offeh and Florence Peake shaking across the gallery floor, plus Mark Bleakley’s intriguing work Three Movements of Funny, breaking down the microphone-handling gestures of three classic American stand-up comics. In his films, Beijing-based Chinese artist Li Binyuan takes a physical approach that can be extreme – making himself vomit by cartwheeling across a bridge, for instance. But his ‘conversation’ between a cigarette lighter and a giant tower block displays humour in the face of urban expansion, and the destruction of 200 hammers in a live performance made a powerful political point. The UK’s biggest-ever survey of Finnish contemporary art was also memorably stylish, featuring Taneli Rautiainen’s spectacular installation Void, made of 154 florescent lighting tubes, and Tiina Pyykkinen’s dark, high-gloss paintings and sculpture. 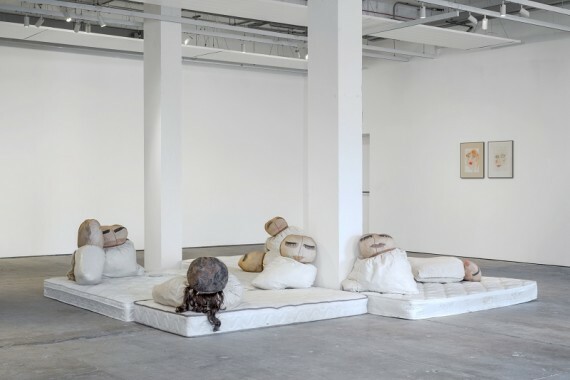 Pauliina Kaasalainen’s fabricated female sculptures and Teemu Korpela’s giant fake antique oil paintings also got visitors doing double-takes. Being a drawer myself I always follow the Jerwood Drawing Prize with a close eye. Although it splits opinion, I still feel the UK’s largest and longest open drawing competition packs a punch. I was impressed by Tom Harrison’s winning piece, From Andrew’s Flat, Singapore (pictured above). Exquisite and subtle with a touch of ambiguity – everything I strive for in my own work. Ever since my drawing tutor at Lancaster University gave me a copy of a book of Auerbach’s paintings and drawings I’ve been hooked. Almost 15 years later I finally got to see in the flesh many of the works I’d studied all that time ago. Featuring paintings and drawings from the 1950s to the present day of people and the urban landscapes near his London studio, Tate Britain’s Frank Auerbach retrospective shed new light on one of the most renowned artists of recent times. There are worse things in life than taking a trip to the seaside, having an ice-cream and then visiting a bloody good show. I’d seen Marcus Coates’ work a number of times and never been that impressed. Everything changed with Fabrica’s superbly curated presentation of Coates’ 2007 multi-screen film installation, Dawn Chorus. Presented as part of the 2015 Brighton Festival, the immersive piece included audio recordings of 19 individual singers who painstakingly recreated birdsong and bird movement. The results were spellbinding. Exploring Pollock’s lesser-known black action paintings created during the final years of his life between 1951-53, the paintings here were presented alongside drawings from the same period, as well as a number of virtually unknown and rarely seen sculptures. For me, this is the most intriguing period of Pollock’s life and I feel more connection with these works than the earlier, better known action paintings. I’m not usually a fan of traipsing round locations in search of artwork – give me a small exhibition of drawings any day of the week. However, I loved the fourth edition of this festival focusing on text-based work. Featured 70 emerging and established artists from the UK and internationally, the added spin was visitors were invited to track down the artworks across Cambridge. In so doing, I discovered some fascinating and lesser-known corners of a city I thought I knew well. Winding up at the top of Calton Hill in Edinburgh and walking into Collective’s glass-fronted gallery is always a revelation because, through the window, you get to watch all the tourists snapping away at the landscape. France-Lise McGurn‘s work, however, snapped me away from the tourists snapping – the multi-use of the space and determination with chosen media made her use of line seem effortless, almost beautiful. A rare treat. When you walk into a space, follow a plastic pipe and figure out parts of it are manipulated glass, follow it some more and see the pipe disappear into the toilet — this all makes you read the label for the work, which in this instance had a (hidden) toilet sink listed under ‘materials used’. With work by Jennifer Bailey, Lauren Hall, Tessa Lynch and Sarah Rose, this was an interesting show programmed by curator Simon Gowing, with artists exploring industrial and manufactured processes, while also dealing with how art objects find themselves within a particular architectural space. This major survey show from Indonesian artist Fiona Tan was presented over two levels of BALTIC and, for the installation DEPOT, included a 76-foot long lorry. One work in particular struck me: Disorient (2009), a two-channel video projection that splices the fantasy and reality of trade routes between Venice and Asia with a narrative taken from Marco Polo’s 700-year-old book, The Travels. The result was no less than spellbinding. After watching Jeremiah Day’s performance on the opening night of this show I left with the question: is movement didactic or is it confusion? I returned in the light of day to see a two-person show that sits somewhere inbetween, with performance-oriented and collaborative elements that suggest a somewhat educational mode. The longer you spend with the work – Bailey’s carefully orchestrated films and Day’s elaborate improvised recorded street performances – the mistier the message gets. You expect to learn something but instead, in a magical way, you leave just that little bit more baffled. 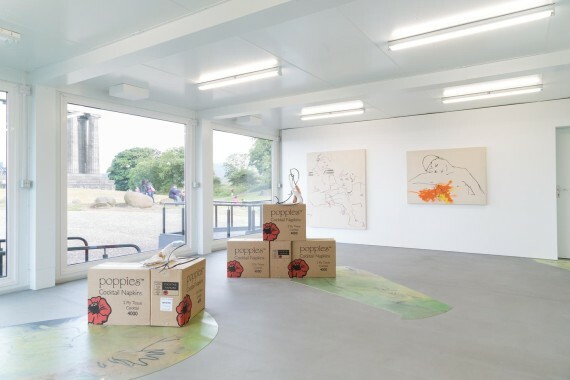 This project at GARAGE – an artist-run gallery comprised of three garages and a garden – has popped up during Edinburgh Art Festival for the last ten years. Open on weekends only, it also featured secret galleries within the basement flat to which the garden belongs. Aside from it feeling strangely voyeuristic to be walking through someone’s back door on a Sunday afternoon and overhearing them talking in the kitchen, it was also a revelation to view the art works in this way, rendering their content all the more vivid. 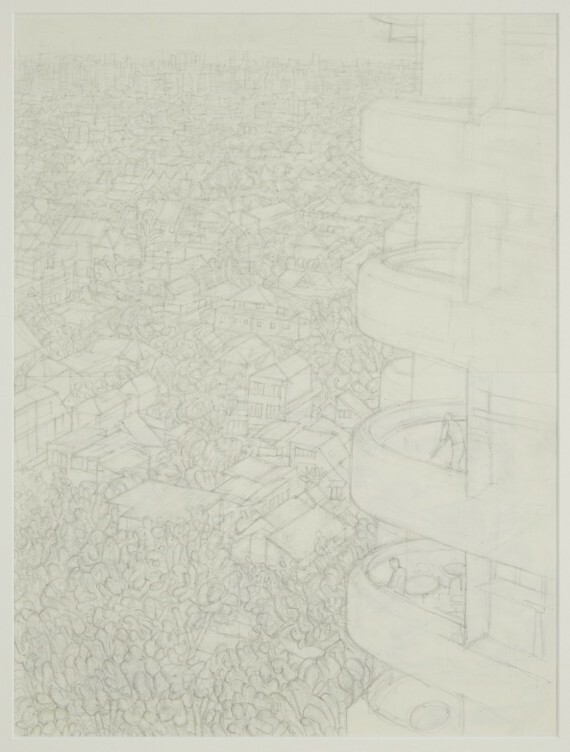 Forster’s extraordinary photo-realist drawing technique may be what initially attracts the viewer to his work, but this exhibition was a chance to really reflect on his choice of subject matter. From antique pastoral nudes and images of the Bauhaus archive, to drawings made from his own photographs of surf breaking along the shore, it’s a diverse selection. But common to all is an attempt to measure our place in the world and explore how we exist as private individuals within the greater society. As a bit of a collector who wishes he had space for more stuff, it was great to spend an afternoon nosing through the art and ephemera that other artists like to acquire. 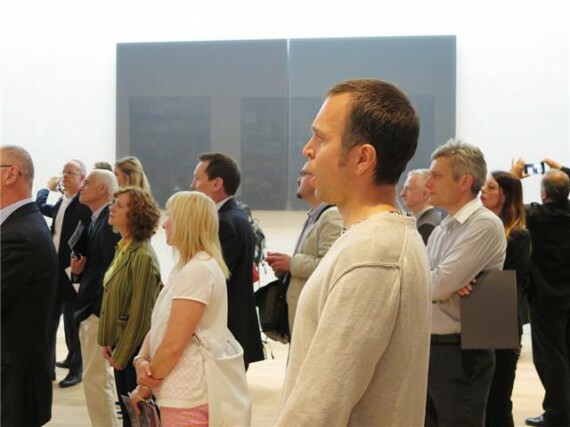 Many of them (Peter Blake, Andy Warhol, Jim Shaw) are now as known for their collecting and hoarding as for their art, while Damien Hirst recently opened a gallery so he could ‘share’ his collection with the public. My favourite display though focussed on Sol Lewitt’s collection of Japanese wood block prints, modernist black and white photography and handwritten musical notations by Steve Reich and Philip Glass, all beautifully displayed alongside Lewitt’s own photo-grids documenting in detail the contents of his downtown Manhattan loft. Ann Veronica Janssens launched Wellcome Collection’s year-long investigation into the experience of human consciousness, States of Mind, by filling the gallery space with an enveloping mist that gradually changed from yellow to blue to pink. It was an oddly supernatural thing to experience, as you searched around for reference points in a relatively small space while ghostly looking, variously colour-tinged figures (the other visitors) suddenly emerged just a few feet from your face. The early Op Art paintings of Bridget Riley also play with our visual perception, and several of these monochrome works were included in this retrospective highlighting the artist’s use of the curve as a motif. But it was the sweeping rhythms of her recent works, where curvilinear shapes are picked out in vibrant blues, pinks and greens, that really caught my eye, particularly resonant in a show that made connections between Riley’s paintings, the elegant modernist architecture of the De La Warr Pavilion, and its seaward views. Malevich’s Black Square was its starting point, but this exhibition looked to dispel the assumption that abstract art – and in particular geometric abstraction – evolved only in Russia, Europe and North America. The first half packed in works by early masters such as Popova, El Lissitzky and Mondrian alongside some less obvious choices, with a strong selection of artists from Brazil and Latin America in particular including Lygia Clark, Hélio Oiticica and Horacio Coppola. And despite losing focus a little in the second section, there was plenty to delight.